Most of you, at some point in your life, have probably seen a horror movie or read a science fiction novel about parasite-like aliens that live inside human hosts, and it surely wouldn't be difficult for movie producers to make a movie that seems almost too real for its own good. But what would you do if YOU are one such unfortunate individual to have one of these creatures living inside you? What kind of reaction would you have when you look at yourself in the mirror knowing there's another entity living inside you? That is exactly what Shin Izumi ("Izumi Shinichi" in original version) has to face and live with in the manga series "Parasyte". 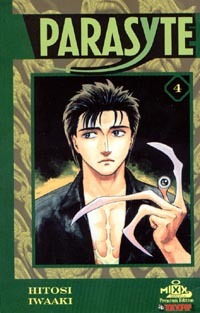 Originally titled "Kiseijyuu" in the Japanese version, the "Parasyte" series was first published in Japan between 1990 and 1995, created by the hands of manga artist Iwaaki Hitoshi. The story is about Shin Izumi and his encounter with "Lefty" ("Migi" in the Japanese version), and how Shin first found out the horrific truth about a race of man-eating creatures that had been living among them inside human hosts -- creatures that can morph into any shape they wish, and even turn part of their bodies into blades and other leathal weapons which they can use to hunt and kill their human "prey." With the advantage of co-existing with one such creature inside him, Shin began to cope with and even learn to take adventage of his newly-gained power and devote all he's got in the lonely fight to protect the human race from becoming one of the extinct species on Earth. Like many of the classic manga series, "Parasyte" is more than just a simple story about one hero fighting against all odds to save the world. The title "Kiseiyuu" (same meaning as "Parasite") may not have been coined for the alien creatures in the story, but for the human race as a whole, as many manga critics in Japan have said in the past. More than once, characters in the series had mentioned the balance of life being thrown off by the exploding human population and other pollusion issues produced as a result.